Just how far has your hair loss progressed? For each individual it is a very subjective question. What you may not know is that there is actually a very objective approach to assessing hair loss progression. It’s called the Norwood Scale. Graded one through seven, the Norwood Scale allows doctors and patients alike to talk about hair loss in a consistent manner. This is especially helpful for patients trying to find the best hair transplant doctor and may end up visiting several surgeons during the process. Having an objective scale means everyone is talking about the same level of hair loss. Level 1 on the Norwood scale indicates no visible hair loss. Level 2 indicates that hair at the forehead is receding to reveal a wedge-shaped patterns. Level 3 indicates a further deepening of the web shaped pattern. 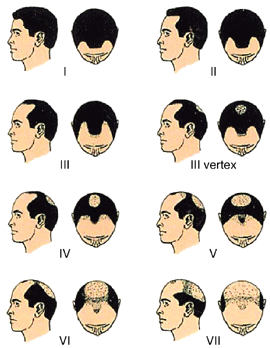 Level 3V indicates that a small bald spot is starting to appear at the top and back of the scalp. With level 4 there is further receding and a more pronounced bald spot. Level 5 is a further progression of 4. With Level 6 the bald spot and the receding hairline have started to connect. With level 7, the hair has receded all the back to the base of the head in back and just above the ears on the side. Once everyone is on the same page when it comes to your hair loss, you’ll be much further along in finding the best hair transplant surgeon. Previous PostPrevious Robots and great hair transplants. Do they go together? Next PostNext Fact vs. fiction and five myths regarding hair loss.